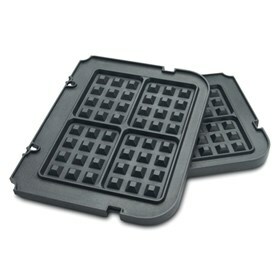 The Cuisinart GR-WAFP is a griddler waffle plates, features nonstick plates which bring more versatility to the griddler. The nonstick plates bake four deep-pocketed belgian waffles at once and wipe clean for a quick delicious treat. The Grill Accessory Waffle Plate compatible with GR-4N has many exciting features for users of all types. You can extend the lifetime of your Grill Accessory Waffle Plate compatible with GR-4N with the purchase of a FactoryOutletStore Factory Protection Plan. The Grill Accessory Waffle Plate compatible with GR-4N is sold as a Brand New Unopened Item.